Since the last (and unblogged-about) field trip was south to Balboa Park again two weeks ago, we naturally had to bounce back up north today. Originally I had planned on hitting Huntington Beach State Beach with the girls and the bikes. We headed up the 5 and then onto California 1 in Dana Point. Drove through what I feel is one of the most beautiful cities in the US (Laguna Beach) and then Newport Beach, only to find the parking lots full at Huntington State Beach. I think they were having an event of sorts. When we were driving north, Crystal Cove State Park (in between Laguna and Newport) caught Allie's eye. 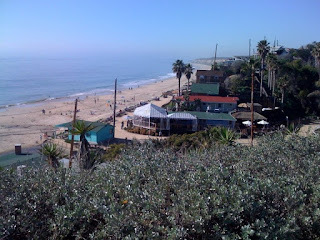 With HB being full, Crystal Cove was our salvation. Upon arrival, we ate our picnic lunch (again in Klaus, the dining room on wheels) and pulled the bikes off the bike rack. The paved trail at the park was perfect for Celeste - plenty wide and mostly flat with very light traffic. No one trying to set land-speed records on their time trial bikes here. We rode a bit and came to some of the quaint 1920s-30s cottages that are now available for rent. These 46 vintage rustic cottages were built by Japanese settlers who rented land from the Irvine Company, the largest Orange County development company. The settlers grew crops and sold them to markets in LA and San Diego, along with manning a roadside stand. Sadly during WWII, the settlers were taken away to internment camps. We then headed on down to the beach for a little exploration. We love the fact that Celeste is a nature girl, she's always been fascinated by critters. Worms, bugs, sea creatures, backyard creatures, etc. It doesn't matter. If it's a living thing, she's incredibly curious about it. Lucky for us, the park has some tide pools, and we visited during a low tide. It was at this point when a rogue wave crashed in to the rocks and gave our three year old point-and-shoot camera a good soaking. My shoes too. We had been talking about replacing the sturdy little unit, mainly because there's something on the sensor (see pic with grrls and bikes above - nice smudge on the sky, eh?). Plus lens was making noise when opening and closing so we thought the end was near. 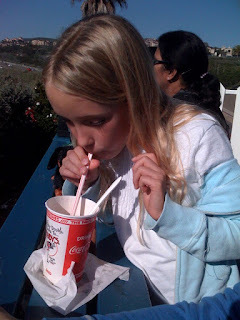 After beach fun, we pedaled our way down to the Shake Shack and enjoyed an excellent treat. crappy cell phone shot of some of the cottages from the Shake Shack overlook. Sun-drenched and tired, we had a great traffic-free drive back home as the Stupor Bowl had kicked off. Another day well spent! Better yet, the camera seems to have fully recovered. It'll be a hand-me-down for Celeste to help encourage her curiousity with photography.